Two weeks ago, Nancy and I were lucky enough to find ourselves in one of the world’s most romantic cities — Rome, Italy — for Valentine’s Day. We found ourselves at sunset relaxing with a drink in one of the neat little cafes around the Piazza del Rotonda. (Nancy’s was prosecco, mine was Italian beer.) The imposing edifice at center-frame is the Pantheon; in front of that is an obelisk brought from Egypt and installed here at the will of Pope Clement XI atop a fountain that was already here before the obelisk arrived, having been done by Giacomo Della Porta under Pope Gregory XIII in 1575. Today, in 2012, we chatted with the friendly waiters and passers-by and enjoyed our drinks. The sun set. The crowd in the piazza did not diminish; it grew. The very impressive Roman Catholic church of St. Mary and the Martyrs (the Pantheon) stayed open well after dark and tourists like us continued to filter into the square, even as couples I took to be locals gradually infiltrated to hang out and do as young couples in love are apt to do around the central fountain (aptly known as “la Fontana del Pantheon”). Finally, I could not stand it any more. I grabbed my tripod and camera and alighted into the piazza. I like to think I had my darling’s blessing: I can be a real pain when I’ve got “the shot” in my eye and can’t see anything else. About 15 minutes later, I was back. “The Shot” was in the memory card, and we were off to dinner. I’m happy to report most of “the shots” I envisioned worked as intended; this is one. This is the first of several from Roma. Look for more as I process the images from our long weekend in Rome. This entry was posted on Monday, March 12th, 2012 at 22:29 pm. 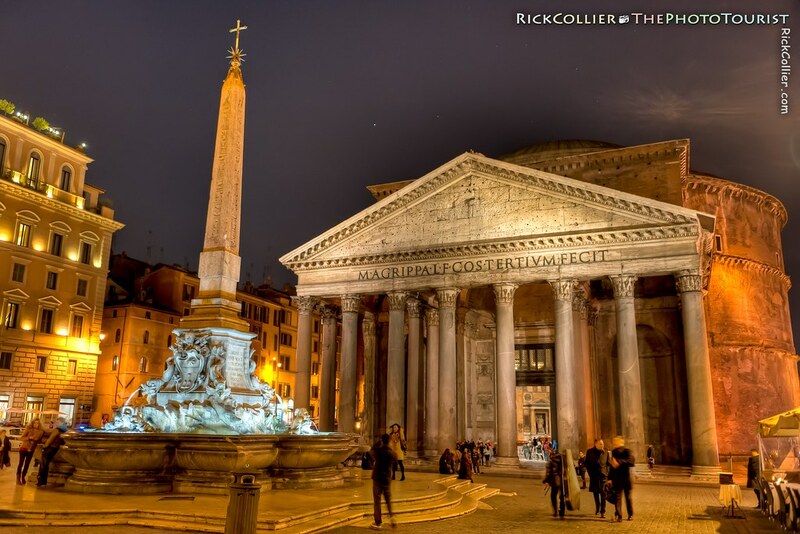 It is filed under thePhotoTourist and tagged with cathedral, Catholic, church, dark, Egyptian, Fontana, fontana del pantheon, fountain, HDR, high dynamic range, Italy, Land & Air, lights, night, obelisk, Pantheon, photo, Photo Tourist, PhotoTourist, Piazza, Piazza della Rotonda, plaza, pope, Roma, Roman, Rome, street lights, the Pantheon, the patheon, the Photo Tourist, thePhotoTourist, tourism, tourist, tourists. You can follow any responses to this entry through the RSS 2.0 feed.